Itai had an aura around him, unlike most of the other Israeli backpackers that I have come across during my travels till date. 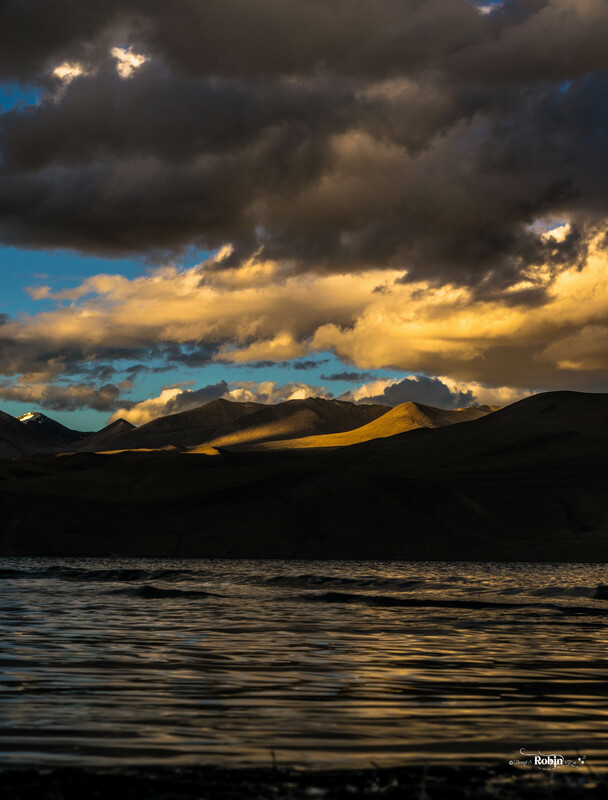 With the evening breeze picking up speed across the white tents lined up along the lake, moving away from the emerald blue waters of Pangong Tso, although still having it in sight, I was led to a makeshift home-stay by one of the locals in Spangmik. Being at the end of my backpacking trip in Leh and running acutely short on cash, the only option left for me was to find another traveler I could share a room with. As luck would have it, there was Itai to my rescue!! Looking under the chassis of his battered and bruised Royal Enfield Classic, which had probably seen more of the remote Himalayan terrains than most mortals do, given how gracefully the bike seemed to have aged, he was all smiles when replying to the room sharing agreement proposed to him. “Well….given the amount of time I have spent in Ladakh on the metal box on wheels you saw at the bus stand a few minutes ago, nothing will probably wake me up once I have dozed off for the night. So I guess we are OK on that front.”, I chuckled at his warning. While the sun gets ready to gently sleep. As the last rays on the sun started to cast shadows of the towering peaks around on the village, I realized my reply was probably unjustified towards the HRTC workhorses that had been my companion ever since I started to venture towards the barren landscapes of Ladakh. But since it helped break the ice between two visibly tired travelers so late in the evening and helped us share a moment of laughter, I am sure the buses would not mind too much about it. 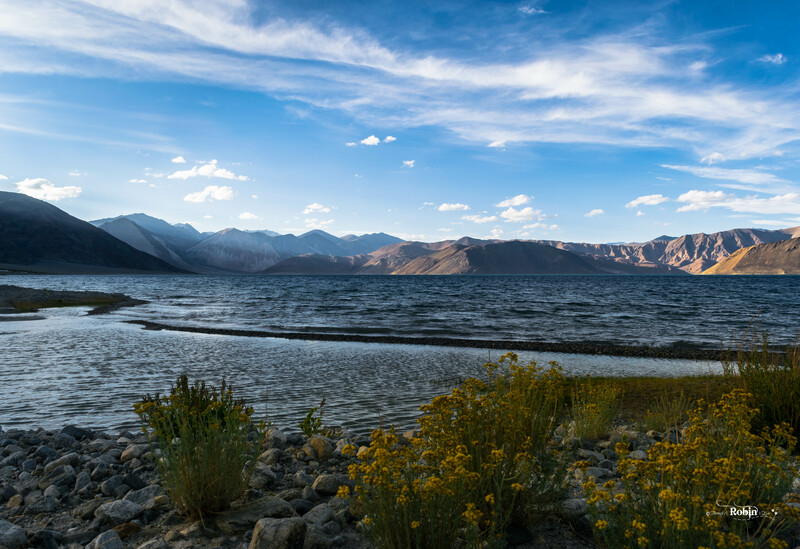 Itai soon wrapped up his repairs and set off on an evening jog along the bank of Pangong while I set down my backpack, picked up my camera and headed towards the clear waters to catch one last glimpse of long shadows creeping up on the barren mountains forming the backdrop of the water body. Soon enough we caught up over dinner table, sharing our mutual admiration for Tibetan cuisines – Thupka in particular. “It’s actually a bit strange for me to have come across a solo Israeli backpacker around here….I mean I have always thought you guys usually travel together with your friends.”, I causally asked. “Actually I won’t blame you for that stereotyping. I don’t mind that stereotype either, to be honest. The generalization is not entirely true, but it is not too far from the truth. It’s one of the main reasons why I occasionally like to stay away from the Israeli backpacking groups.”, he replied while resuming with his meal. “I came to India with a group as well, but soon grew frustrated with the whole ‘moving as a pack’ thing. I finally found my release when I met a German biker in Leh a few weeks ago. He was riding the old beauty you see parked outside now and was planning to sell it off to buy himself tickets to Gokarna. Without a second though, I bought this one for a throwaway price! !”, he told me with a broad smile on his face. “It was something I had been planning to do since a long time, so I immediately jumped on the opportunity of exploring the Himalayas on a Royal Enfield. It’s been around 1 month on road now and my journey is ending soon. Tomorrow I will leave Pangong to Tso, taking the road all the way back to Leh where I will sell this bike and rejoin my group in Dharamshala in a week’s time. I guess it will be back to traveling in group for a few more weeks thereafter. Ahh by the way, should we head to our room now? It’s getting a little windy here! !”, he rubbed his shoulders vigorously as a suggestive gesture. Itai had been carrying a box filled with beer bought from Leh with him all this while. For him to have offered some to me was like he was reading my mind – given I had been craving for the beverage at these altitudes for the past few days!! On the journey towards a beautiful end. “Correct, my friend!! How did you guess that? India is where most of us run to after we have served our time. Beautiful nature, lovely people, awesome vibes and totally inexpensive……where else would I be able to ride this Royal Enfield for so cheap? If I were to buy something similar in Tel Aviv, for example, it would have cost me almost….ahh let me think…..around 18,000 shekels I guess. That would mean almost 3 lakh Rupees – and I am talking about a used bike!! So you see, coming to India makes a hell lot of sense..”, he said with a broad smile on his face. Itai did not even bat an eye before smiling at my question. “Outsider?”, he replied. “You understand the situations well it seems. Though not so obvious a reason why many young travel counterparts of mine head to India or other such destinations, it is also a factor somewhere at the back of the mind if you think about it. Most of us do like to travel anyway, and we save money during our college and service time so that we can treat ourselves with a deserved vacation. But I cannot say your question is wrong either.”, he said while the smile faded from his face a bit. “The kind of things I have seen in my service years I wish nobody ever has to”, he resumed. “I do not judge you on your political stand or expect you to completely agree with me, but I will share my experiences nonetheless. When you get a tip that few terrorists from Hamas have been taking refuge in a building and you plan for an offensive – only to find out that the building was but a civilian hospital filled with innocent civilians and patients, how can you come to terms when you are forced to retaliate to the terrorists firing at you from the windows? They used these positions and civilians as human shields and you only get to know about it when you are faced with a life-and-death situation on the front. Tell me, how can you reconcile with your actions later on when you are back at your base, alone? Irrespective of whose side you are and how noble your intentions might be, watching an innocent civilian go through that and left to bleed by the terrorists – people who have got nothing to do with the wars, are memories and images which no amount of traveling and introspection can erase…….I hope I am making some sense to you”. His voice became heavy at the end of his recounting. The strong cold winds banging against the window shades was the only sound breaking the shroud of silence that had spread across the room at that moment. With a lot of my cousins serving in the armed forces I have had similar conversations with them too and I can understand how difficult it is to walk the thin line of justice when faced with your duty. Just when I feared I might have touched upon a raw nerve somewhere, a broad smile broke on his face as he took out another beer. “But I must tell you the service years are not so cool as you may think”, he resumed. “We only get to work at lower ranks in the forces and are paid considerably less than what an average working professional friend of ours does in Israel. If you cut down your expenses during the service years then the compensation would barely be sufficient to sponsor a month’s vacation, to be honest. Unlike many of my friends, I did not take any money from my parents during my service years. I saved up a lot of money to earn this vacation for myself. So I intend to enjoy it as much as I can – after all it is probably my first “investment” of my adult life! !”, he said with a broad grin. Atleast Itai had his investment portfolio sorted out at such a young age, unlike me!! I did envy him for being surrounded with traveler friends in his neighborhood in Israel and that he came to know about the beauty of traveling so early in his life. Although, it still required a lot of courage on his part to leave everything behind and embark on a journey on an unknown land thousands of kilometers away; the kind of courage I have been trying to muster for so many years now. “So, my friend, let’s talk about something funny now…….tell me what do you think about this Donald Trump guy?”, he asked. Needless to say, we both had points enough to take our conversations late into the night afterwards.